Illinois professor Mara Wade has been awarded an international research prize given to scholars whose work has shaped academic and cultural relations between Germany and their own countries. Wade is using the prize to continue research in Germany on her work on how emblems have been used as forms of communication. CHAMPAIGN, Ill. — Mara Wade, a University of Illinois professor of Germanic languages and literatures, has received the Reimar Luest Prize for International Research Cultural Exchange, a competitive prize given to scholars whose research has shaped academic and cultural relations between Germany and their own countries. Wade is one of two winners this year of the award given by the Alexander von Humboldt Foundation and the Fritz Thyssen Foundation in Germany. The winners receive a cash award of 60,000 euros (about $68,667 at the current exchange rate) for further research projects. Wade has achieved international recognition in the areas of emblem research, research on European aristocratic and festival culture, gender research and research on the urban culture of Nuremberg, according to the announcement of the prize from the Humboldt Foundation. She is the principal investigator for Emblematica Online, a multiyear international digital humanities research project funded by the National Endowment for the Humanities that established a database of collections of books on emblems. Emblems are concise combinations of text and images used in 1500-1800 and usually consisting of a motto, a puzzling picture and an epigram. They were used to spread cultural knowledge of such subjects as philosophy, politics, science, religion and everyday life. Wade’s research has a strong focus on digital humanities. The prize will also support research for another monograph project, “Emblems as Public Monuments: The Nuernberg Town Hall Emblems.” Wade will visit the state archives in Stockholm in May for research on the letters and papers of Carl Gustav Wrangel, a Swedish field marshal during the Thirty Years’ War. Wrangel commissioned a set of ceremonial weapons with emblems inspired by those he saw painted in the Nuremberg town hall during peace negotiations in 1649-50. Wade also will spend two months this summer at the University of Erlangen-Nuremberg in June and July, where she will do research on her project on emblems in 16th- and 17th-century Nuremberg. She’ll work with professors Dirk Niefanger and Werner Wilhelm Schnabel (who nominated her for the Reimar Luest Prize) to plan future research, conferences, grants and publications resulting from the Nuremberg emblems project. That project is based on a volume she identified – a 17th-century hybrid print and manuscript volume by the humanist Georg Rem that is a biography of the Free Imperial City of Nuremberg as told through its public monuments. Following a September 2018 international conference on this volume at the Newberry Library in Chicago, Wade was in residence last fall at the Getty Research Institute as the recipient of a Getty Residential Scholar Grant. 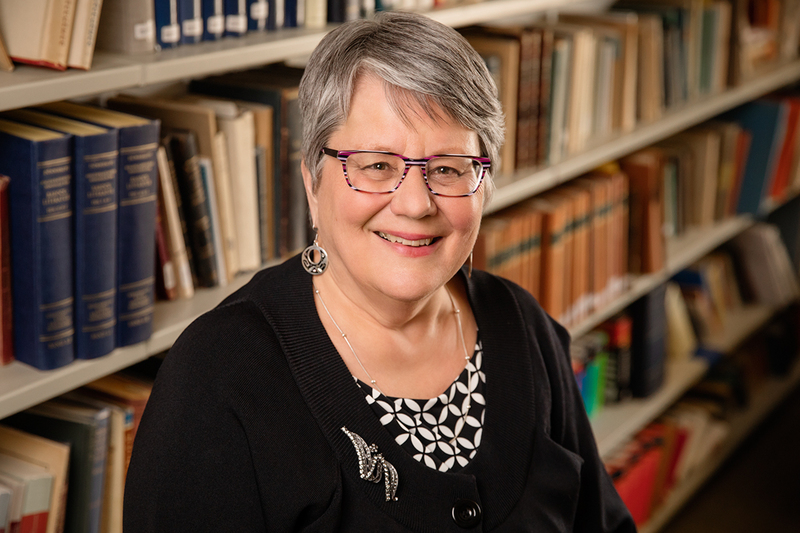 She used the residency to work on her book “The Politics of Culture: Public Monuments in the Free Imperial City, Nuernberg 1521-1620,” based on her research of the Rem volume.